Just think about that for a moment. A model which has dropped in price by 67% in 12 months. That is disruption on a major scale. The solar panel business and the battery storage business is likely to be a continually brutal Darwinian space and require huge capital to supply the necessary scale because of the structure of the technology and the cost reductions that are occurring. This raises the question of what is the smart play in this space and I think it is in staying away from the panel and battery technology space and playing in business model innovation at the layer above that. Is Moore’s Law Really a Fair Comparison for Solar? 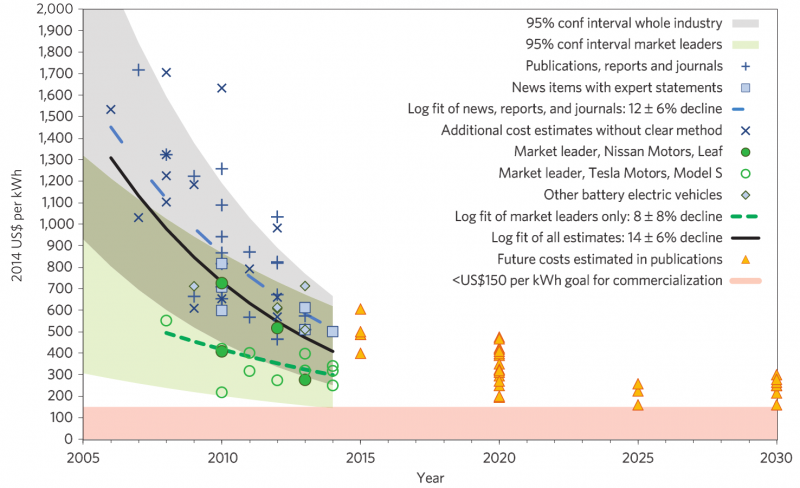 looking at the falling prices in battery storage. I think both articles make excellent points but the main issue is the cause of price change over time which has been 60% annually for transistors and 14% annually for solar (over 37 years) according to Naam. Analysis of the two articles indicates that the change in transistors has been far more driven by technological innovation while the pace in solar has been more by the classic cost learning curve and move to scale. There are parallels for this in other sectors. The sports clothing company Under Armour is pursuing a strategy for fitness apps to complement its sports clothing sales. That strategy is hardware technology agnostic in that it integrates with a range of technologies that users are adopting. This means they do not tie themselves to any particular hardware solution and avoid riding on top of a technology that fails. Full disclosure: I have recently worked for the sugar milling industry here in Australia on energy transition scenarios. I may in the future have a financial interest in community models.